room) for each night reserved. The Religious Service will commence on Thursday, April 25th at 9:00 AM and will be conducted by Reverend and Right Worshipful A. Robert Nix, Grand Chaplain. Following the Religious Service, the Grand Lodge will be officially opened at 10:00 AM by Most Worshipful Michael D. Smith, Sr., Grand Master with the assistance of the Grand Lodge Officers and Brethren. The Annual Banquet will be held on Thursday, April 25th at 7:00 PM in the Ballroom of the Marriott Hotel. It is now apparent from all forecast models that Hurricane Florence will impact South Carolina with high winds and rain beginning Thursday, September 13th through Monday September 17th. All prediction models from this afternoon indicate that the northeastern shore of South Carolina will have an major impact with devastating rainfall and flooding for several days. While it has yet to be determined where the eyewall will impact the east coast, this is going to be a major category 4 storm strength and rainfall amounts up to 20 inches which will impact on our Great State. Safety is of the utmost importance for all citizens and for all of our members in this Grand Jurisdiction. I am encouraging all Worshipful Masters to act in the best interest of your members and Lodges. It is my decision as Grand Master of Masons to allow the Worshipful Master or Wardens to postponed the September Regular Communications as deemed necessary for the following reasons without need for Special Dispensation from the Grand Lodge and Grand Master for the Week of September 10th in preparation. Regular meetings scheduled during the storm the week of September 10th. In the aftermath of the storm, if the Lodge has no power, no potable water (drinking water), or if the Lodge is unsafe from storm damage or otherwise. In preparation for the storm, please encourage all your members to take the proper precautions by planning ahead and seeking the safest options for their families. Check on your elderly members and make certain to follow up after the storm as well on their safety and well-being. This is what true Freemasons do for one another. If possible, the Lodge should also prepare as best as possible in the primary impact zones to prevent and much damage as possible. Sand Bags at the exterior wall to prevent water from entering under doorways in low areas. Taping or securing windows and doors if necessary to prevent wind and water damage. Unplugging or de-energizing appliance and unnecessary sources to protect against power surges that could cause fire. Obtain some drinking water and necessary supplies if your lodge could possibly serve your members or community as a temporary shelter if necessary. Plan where possible to be able to prepare a meal for displaced members, families if necessary. Grills may be very useful in the coming days. It is indeed my prayer Brethren, for the safety and well-being of all of our members and communities. May the God of Lovingkindness, Mercy and Grace be with us. Remember we make a difference every day as Freemasons, no matter what the day may bring! Stand tall and remember that God is with us always. Plan to resume Regular Communication as quickly as safety permits and to let your DDGM, the Grand Lodge and Grand Master of status of your Lodge as soon as possible. If your Lodge has any other reason for delay Regular Communication, that would require Special Dispensation using the normal protocol. ​Ruby Lodge No. 314 is now in possession of the State Gavel. They welcome any lodge to come and get it and keep it traveling. 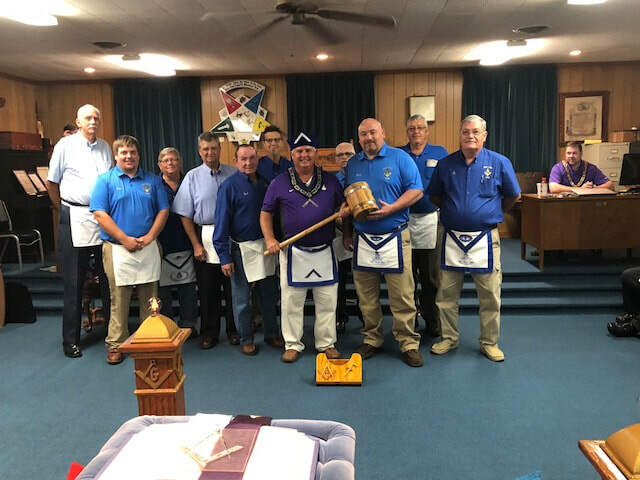 It was retrieved from Batesburg Leesville Lodge No. 138 on June the 12th. 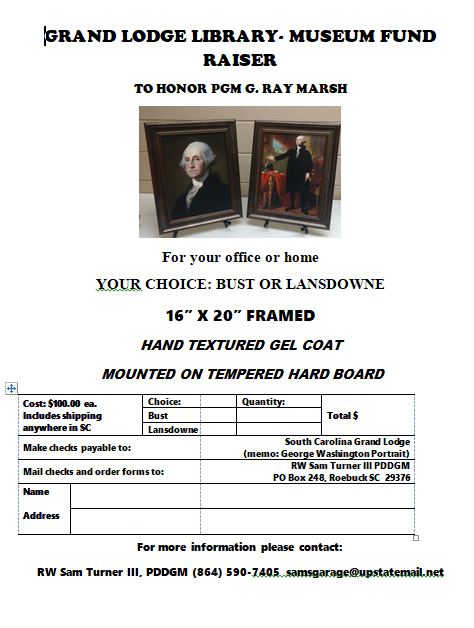 ​Our Grand Master with the assistance of RW Atkins has set a date for us to travel to the Richard Campbell Veterans Center to visit and present the supplies on Friday, November 24, at 2:00pm. We will be taking the supplies that were donated and present these to the Veterans. Our plan is to put together 225 care bags or gift bags and box the remainder of supplies for storage at the center. We plan on meeting at the Greenville Scottish Rite Center on Monday, November 20, at 5:00pm - until. 817 Cleveland St, Greenville, SC 29601 to put these together. 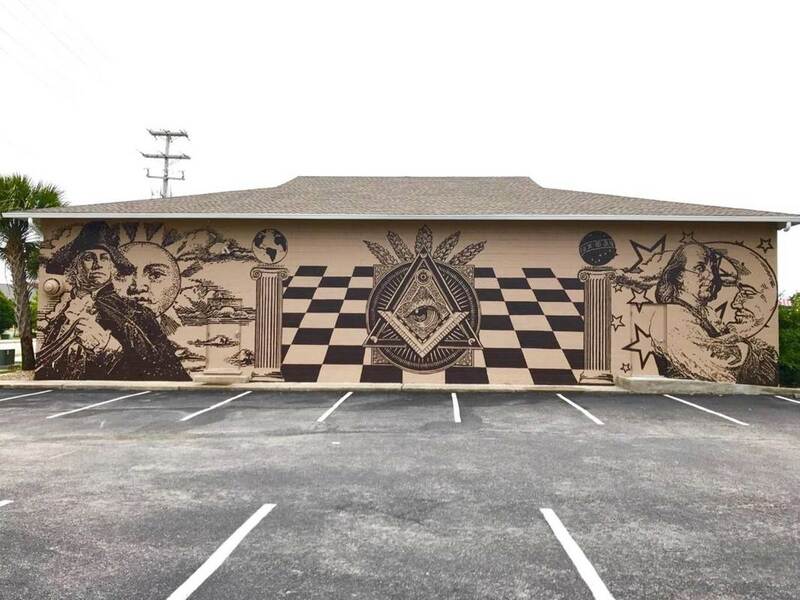 Masonic Mural painted by Costal Carolina Students on the outside wall of Grand Strand Lodge No. 392. ​Congratulations to Ms. Debbie at our Grand Lodge. 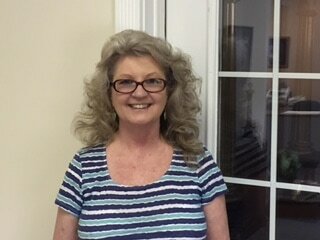 She is celebrating her 47th year of service today June 22nd. Thank you so much for all that you do for each and every one of us. It is truly appreciated! by the Brothers of Martinez Lodge No. 710. Included were a white Sixty Year Apron, Grand Master of Georgia Coin, Martinez Lodge No. 710 Coin, Sixty Year Certificate and a Martinez Lodge No. 710 Member Emeritus Dues Card. The ceremony was held in the Chapel of the Veterans Victory House, Walterboro, SC on Saturday, March 5, 2017. 670 Verdae Blvd, Greenville, SC 29607.
will be officially opened at 10:00 AM by Most Worshipful William B. 7:00 PM in the Ball Room of the Embassy Suites, Greenville. are responsible for making their own reservations. In recognition of and appreciation for the service of our Masonic Brothers, James Island Lodge No. 396, AFM of SC will be conducting a Special Communication on November 4, 2016 at the Veterans Victory House under a dispensation granted by the Grand Lodge of South Carolina. Starting promptly at 7:00 PM, the purpose is to honor the Military and Masonic service of resident Veterans Victory House Brothers. All Masons, family and friends are invited to attend. The Lodge will open on the Master Mason Degree. Once open, the Lodge will move from Labor to Refreshment for an open forum of Masonic Demonstration, VVH Brother participation and then Individual Recognition of each of these Masonic Brothers. Family and friends are invited to attend this portion of the Special Communication. When completed, the Lodge will be purged and the Lodge will go from Refreshment to Labor and close on the Master ​Mason Degree. The Special Communication is scheduled to end by 8:30 PM. ​We are honored to have MWB Barry A. Rickman, PGM (2009 - 2011) as the lead presenter for the Certificates of Appreciation and Personal Letter of Thanks to each Veterans Victory House Masonic Brother. Assisting in making the presentations will be RWB Joe Wells, PDDGM of the Seventh Masonic District and MSA Field Representative for the Veterans Victory House and RWB Dale A. Schumann, DDGM of the Second Masonic District and a member of​ James Island Lodge No. 396. Dress is coat and tie with equivalent dress for ladies and children. Bring your Masonic Apron and Dues Card. No food or beverages will be served. There are water fountains and vending machines for your use as well as rest rooms. This outreach is supported by the Veterans Victory House Administration and the MSA in South Carolina. This will be an annual event occurring the first Friday of each November; at 7:00 PM. Other First ​and Second Masonic District Lodges will be offered the opportunity to host the Special Communication on the first Friday in November in the future.